LOCUS Impact Investing is pleased to share new national Transfer of Wealth information in a special report, "$9 Trillion and Counting," produced by The Chronicle of Philanthropy. By tracking the transfer of wealth across generations, this report shines a bright light on the resources that philanthropic organizations across America might tap in the years ahead to support local impact investing. In the coming months, the Chronicle will share stories about how foundations utilize this data to sharpen their strategic focus and create more impact in their communities, and we will be sure to share with you! Communities and regions need tools and support for moving from understanding their transfer of wealth opportunity to developing strategic and long-term investments that will make a difference in the futures of their communities. 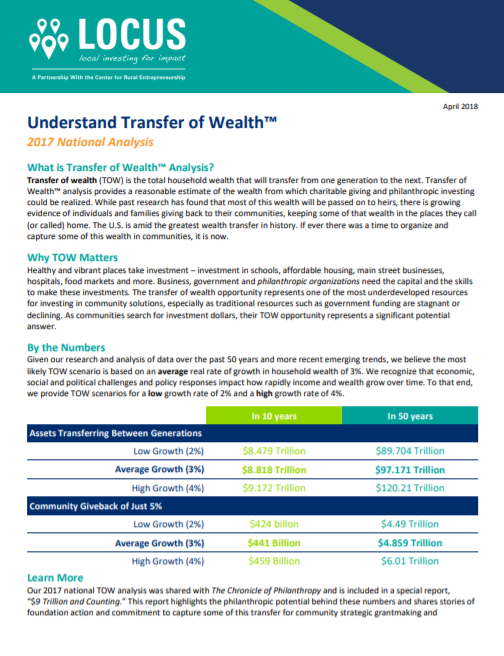 Transfer of Wealth™ analysis is one way we bring empowering research to community leaders as a decision-making tool. 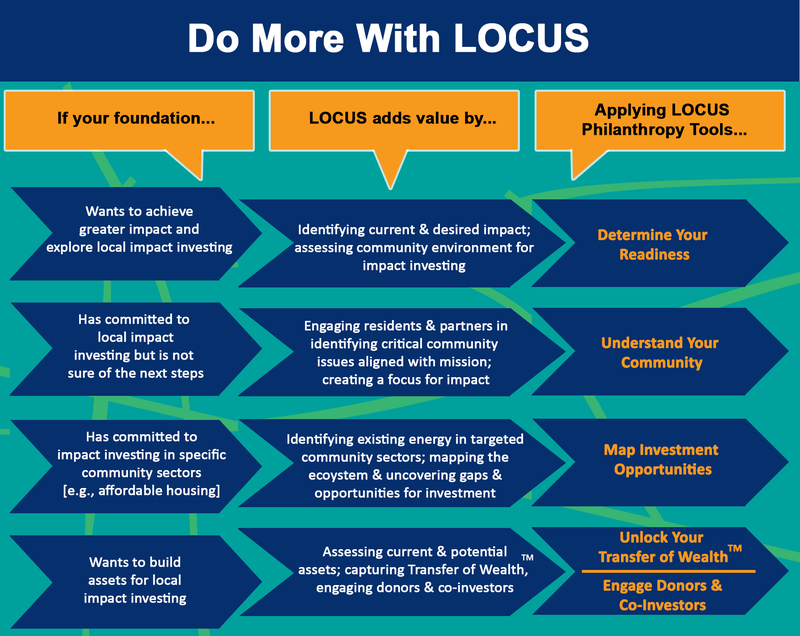 At LOCUS, we not only calculate your TOW opportunity, we provide a wide range of philanthropy tools — from research and analysis to local investing services — to empower place-focused institutions to invest their capital locally to build prosperous, vibrant communities. Visit our LOCUS Philanthropy Tools section of this website to learn more! For more about the National Transfer of Wealth™ Report, click the image for a summary. Healthy and vibrant places take investment: in affordable housing, social enterprises, daycare centers, local businesses, and much more. Want to Know More About LOCUS?